The media talks a lot about these companies and their un-profitability. Here we will attempt to break down why they are not profitable, explain how they are completely different services, and show which one resembles the new music model. 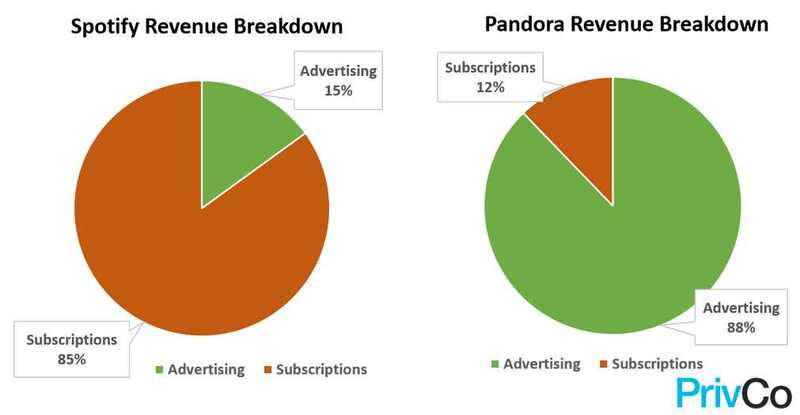 Why Pandora hasn’t turned a profit in 10 years is scary. Their service is good, everyone uses it, actually 25% of America uses it. 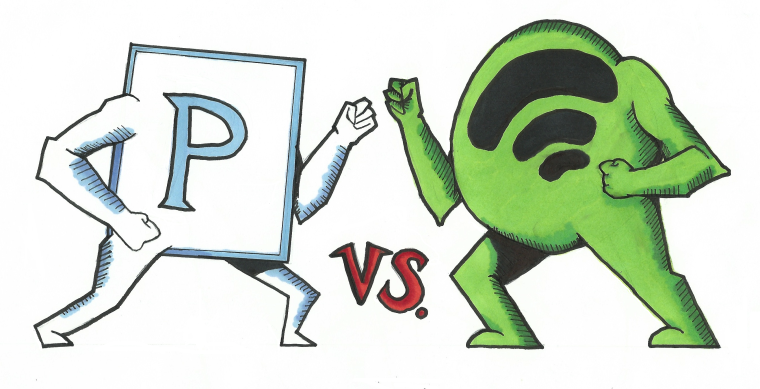 Yep somewhere around 75 million users are Pandora listeners, or about 1 in 4 Americans. This is great number for advertisers because they drive 70% of Pandora’s revenue, but just like terrestrial radio they are a passive listening service, or non-interactive. Where these companies are the same: Right now they are both unable to turn a profit. The reason they are unable to profit is because the licenses for digital far exceed the licenses needed for terrestrial. 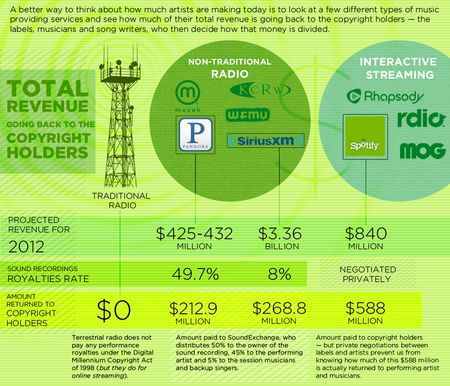 Pandora and Spotify payout 55%-75% of their revenue to the labels in the form of licenses or as they like to say royalties. Labels and Digital providers (DSPs) have non-disclosure agreements so artists are forced to take whatever is offered with zero transparency as to why. Imagine if FM radio paid out 70% of their advertising revenue back to the label. but it is NOT true. They aren’t even in the same business. It all looks very simple given their revenue models. Spotify has subscriptions driving their service and Pandora has advertisers. Spotify offers an ad-based product with their version of @SpotifyFreemium, but where they win is the interactive service is where music listeners generate most of the action. This approach alone says that the new music model will thrive here. Listeners activate the music and advertisers follow it. In an interactive platform like Spotify, the direct-to-fan transaction gives the service momentum. The fact that they are only 5 years old with more subscribers than Pandora (a 10 year old company) shows that people pay up when they have a choice in the matter. The engagement that all internet radio services are trying to achieve can only be found inside the interactive platform. I’ve had Pandora since 2006 and have long since created the maximum 100 stations. So to get new music inside Pandora I have to get rid of some? What listener wants to do this? Pandora believes they will win on the ‘engagement’ front, but in reality their service is a subjugated listen to the passive audience which accepts their pick of music. This sounds a lot like the radio broadcasting model. In no way, shape or form will the 20% Superfan be convinced to give up their listening habits to a service which does not allow them to choose. Spotify hasn’t turned a profit either but my bet is on them. The interactive or on-demand service allows the listener, the fan, the user to have an active say in what they hear. Never before has this been so meaningful to the music industry. UPDATE: Three years later Spotify is even heavier in bed with the labels. They are not poised to break NEW sounds with this model.